Four-bedroom Villa Rustem is a 300-year-old Turkish farmhouse that has been beautifully restored with fresh, modern interiors. Four-bedroom Villa Rustem is a 300-year-old Turkish farmhouse that has been beautifully restored with fresh, modern interiors. It still retains its authentic charm with original features like stone walls and rustic wooden beams. With its breath-taking views over Kaya valley and Kayakoy ghost village, large private swimming pool an abundance of inviting spots for relaxing, it's holidaying at its best. All the rooms are bright and airy, with whitewashed walls and natural decors, such as light wooden floors and cream-coloured linen. The four charming bedrooms each have a balcony looking out towards the lush, green surroundings and en-suite shower rooms for your utmost comfort. There's also a marble reception hall and a comfortable lounge with glass doors showcasing the vistas. Tastefully designed for a self-catering stay, Villa Rustem has a fully-equipped kitchen with marble worktops and an island for extra space. Amenities include a dishwasher, a microwave and a washing machine. There's also a sitting room with comfortable sofas and a traditional Turkish fireplace cut into the stone, alongside a private terrace off the king-size bedroom for enjoying the magnificent mountains. Outside, the turquoise glass mosaic infinity pool is the star of the show, and backs onto the mountains. It's surrounded by an extensive paved space, dotted with sun loungers and chairs and provides the perfect spot for lounging in the sun or the shade. You'll also find a shaded area, under which sits a dining table – ideal for taking your morning coffee with the peaceful atmosphere. Villa Rustem nestles into its surroundings, and if you look closely, you might see eagles hunting or hear the tinkering of goat bells while they nibble on the wild sage. The lovely valley is an oasis and if you'd like to go exploring, it isn't far from Fethiye town and the stunning Oludeniz lagoon. 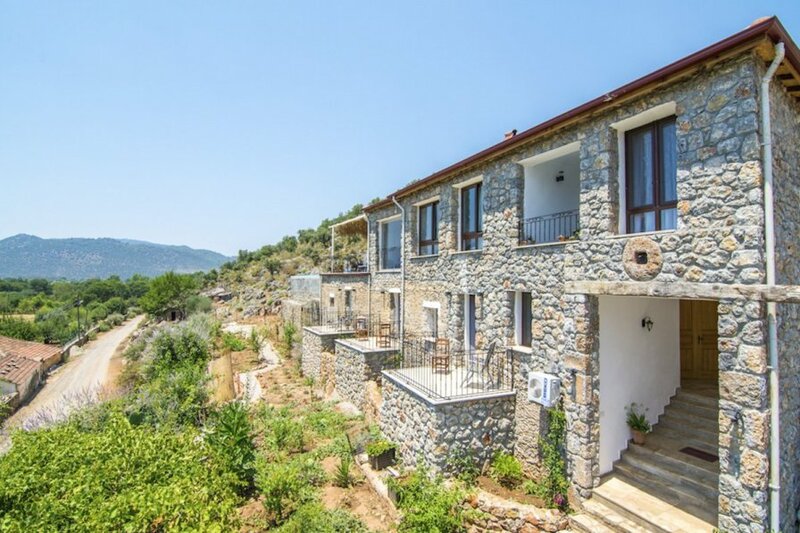 Villa Rustem is near the ghost village of Kayakoy, 8km south of Fethiye in southwestern Turkey. Nestled in the mountains and overlooking Kaya Valley, it's a quiet spot and is an ideal place to go walking or hiking. From the villa, it's a short walk to this atmospheric abandoned village, the inspiration for Louis De Bernier's ‘Birds without Wings', novel. In the local area, you'll also enjoy a peaceful and bohemian atmosphere, and there are traditional restaurants and shops nearby. In Fethiye Town to the north, you can visit ancient rock tombs such as the 4th-century B.C. Tomb of Amyntas, which are magnificently carved into the mountains. For foodies, there's a fish market and other markets that sell everything from homemade rugs to fresh produce. You can sample the local delicacy – delicious gozleme (thin dough crepes) – or visit a Turkish Bath for a relaxing treat. If you enjoy walking, you can use the Lycian Way. It's a series of paths from Kayakoy Ghost Town to remote beaches like Cold Water Bay (around 5.5km away). The bay is family-friendly with turquoise swimming waters and a sandy shoreline. The paths also go to the monastery ruins of Afkule (around 4km away), which are dramatically perched on cliff ledges above the Aegean Sea. For fun family-friendly day trips, near-shore islands by boat beckon. There's the turquoise lagoon at Oludeniz, which is a prime swimming and water sports spot due to its crystal-clear and calm waters. You can also visit Butterfly Valley (about 24km from Fethiye) – a serene nature reserve that's home to diverse butterfly species. Further afield you'll find the Lycian site of Tlos and Saklikent Gorge.